This top quality and sassy costume includes a gold trimmed embossed vinyl corset vest, gauze blouse, pants, bandana, gold trimmed boot tops and hat. Headpiece is open in the center. Moral or immoral as this doesn't matter when people see Pirate character with amusing look and smile never leave their faces. Are you planning to wear old salty pirate costume this year? Keep a weather eye on the horizon and lets start pirate adventure. You surely deserve to get all fun all night with your gang. Lets start here with perfect looking theme costumes which are easy to wear and carry. 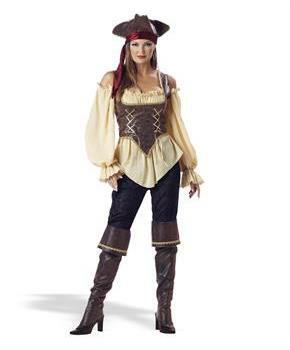 If you are looking for a classic and gorgrous costume than choose Rustic Pirate Lady - Elite Adult Collection costume.